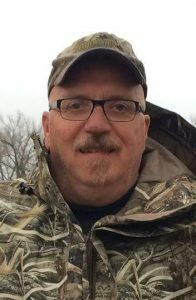 Michael E. “Jake” Kroeger, 60, of Schuyler, died Friday, January 27, 2017, at his home east of Schuyler. Visitation Tuesday 3:00 p.m. to 7:00 p.m.
Wednesday 9:00 a.m. to 11:00 a.m.
Michael E. "Jake" Kroeger was born October 24, 1956, in Schuyler, Nebraska to Marvin E. and Betty(Price) Kroeger. He attended Schuyler Schools and graduated from Schuyler High School in 1975. On November 6, 1976, he married Kerri Jo Schmidt. They later divorced and on January 22, 2002, Jake married Chriss Pellan in Puerto Vallarta, Mexico. He lived his entire life in Schuyler. Jake worked for Pepsi Cola for 23 years, Technique Manufacturing in Columbus and was presently self-employed with Sunbelt National Marketing. Jake was passionate about his family and they spent every weekend at the cabin on the Platte river, fishing, duck hunting, treasure hunting with his children, airboating and driving the Ranger through the pastures. Every Friday, while the kids were in school, Jake would prepare all the food for the weekend and get the cabin prepared. As soon as school was out, it was off to the cabin for the weekend. Chriss and the children were the most important part of his life. Jake was a member of Ducks Unlimited and the Nebraska Airboat Association. He is survived by his wife, Chriss Kroeger of Schuyler, four children, Matt Kroeger of Columbus, Hanna, Jacob and Kaleb, all at home, one brother, Scott(Nancy) Kroeger, Schuyler, mother in-law Anita Pellan of North Bend, sister-in-law Cindy(Jeff) Horn, Fullerton, two brothers-in-law;Mike(Gabby) Pellan of Folsom, California and Jerry(Cecilia) Pellan of North Bend. He was preceded in death by his parents, Marvin and Betty Kroeger, step-mother Opal Kroeger, and an infant son, Andrew Kroeger.